Six months after Hurricane Maria, and whole towns in Puerto Rico still remain without power. To imagine living for half a year without energy, try this experiment. Turn off your lights and television. Unplug your refrigerator, your washer and dryer and stereo. Leave off your faucets, because your town’s pumps need power, and your phone too because who knows when you’ll be able to charge it again. Naguabo firefighter Ronald Vega was dealing with such circumstances when we visited his family home in January. He was one of the 70,000 people living along the coast whose home still remained without power. At night, Vega and his two daughters ran a gas-powered generator for light. But during the day, Vega’s house sits quiet without the buzz of electricity. The refrigerator doesn’t hum, the ceiling fan is still. “It’s such a tough situation. I’m paying at least $15 a day for the fuel of my generator during the week,” said Vega, who makes less than $20,000 a year. During our visit, major highways were free of debris, but signs of the devastation lingered in most towns. Trees and power poles leaned haphazardly across roadways in Naguabo and Humacao, two southeastern municipalities where Maria first hit. Lines of cars and trucks crawled along a beachside road, careful to avoid the dangling powerlines. Even the homes that do have power are often struck with power outages. But a few miles away from Vega’s home, Naguabo’s firehouse sat energized, thanks in part to a 6,600-kilowatt solar system and a humanitarian effort led by a San Francisco-based nonprofit called Empowered by Light. 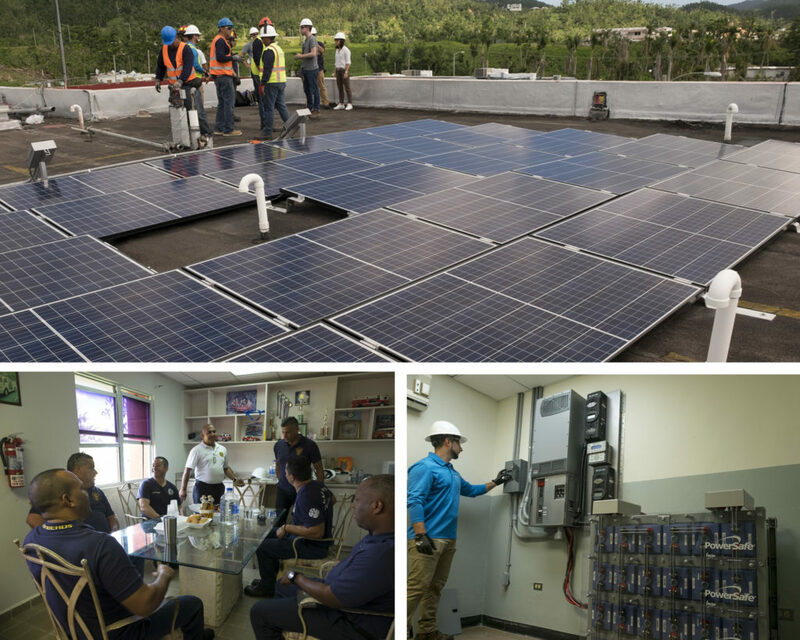 After Maria knocked out emergency communications and water resources across the island, the organization teamed with the Las Vegas Fire Department to install solar hubs at firehouses across the island. 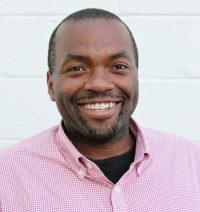 Sunrun, a Bay Area solar company, provided solar panels and solar batteries, while a local construction company called Aireko installed solar-powered water filtration units. These organizations were among dozens to provide renewable energy after the storm. But making renewables a mainstay will require more than solar panels and wind turbines. There’s also a monopoly and Congress with which to contend. When Hurricane Maria slammed into central Puerto Rico, the entire town of Adjuntas went dark — save for one pink building known as Casa Pueblo. Founded in 1980, Casa Pueblo is half community center, half environmental organization and fully powered by solar. “Casa Pueblo has been running on solar power since 1999, so we’re not new in this. After the hurricane, our facilities were intact, as well as our energy system,” said Arturo Massol, Casa Pueblo’s director. After the hurricane, the building became a refuge. The center’s solar microgrid — a self-contained island of power that doesn’t need any outside energy to operate — allowed the people in Adjuntas to charge their medical devices and phones. Its community radio station broadcast news updates in the days after the storm, Massol said. Solar panels can survive hurricanes, even Maria’s 150 mile-per-hour winds. Not so for the power plants residing not far from Adjuntas. A number of factors made this grid uniquely vulnerable. Puerto Rico Electric Power Authority (PREPA), the island’s sole energy supplier for 1.5 million subscribers, had built its grid over 76 years. Most of the island’s power plants reside in the south, where the storm made landfall. These facilities run almost exclusively on imported fossil fuels, with 98 percent of the island’s energy supplied by coal, natural gas and oil. The first wave of Maria flooded those power plants and destroyed ports, which should have stalled but not stopped the energy supply. The death blow came in the form of overgrown trees. Prior to Maria, PREPA had racked up $9 billion in debt and its Fuel Procurement Office faced a corruption scandal. As a result, much of Puerto Rico’s grid was 20 years out of date when the storm arrived. In a matter of hours, trees toppled hundreds of miles of old school transmission power lines. Rebuilding a grid for 3.5 million Americans in mountainous terrain takes time. The U.S. Army Corps of Engineers helicoptered supplies and employees to secluded valleys, but it has also been forced to hand-dig holes in places where heavy equipment can’t go. Also slowing recovery is The Robert T. Stafford Disaster Relief and Emergency Assistance Act. This legislation, which sets the terms for how emergency funds are allocated, requires buildings and other infrastructure to be restored to their original state after a disaster. One stark example involves “Puerto Rico special” — a type of wiring specific to Puerto Rico that is used for electricity lines. Early in the recovery, U.S. stockpiles of Puerto Rico special ran out, and the government was forced to contract with factories overseas in Canada, Mexico and South America. Other materials, like poles, were running short when we visited– due to demand from areas hit by other Hurricanes, Harvey and Irma. 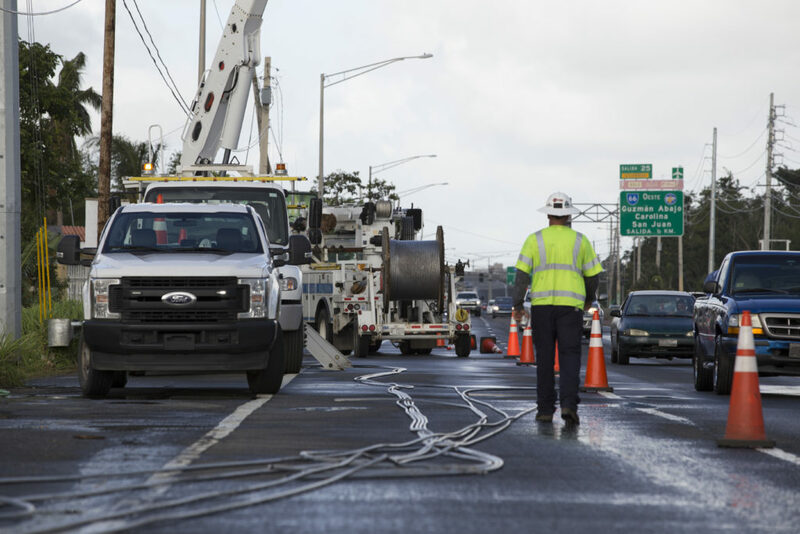 The Army Corps and PREPA had received only half of the 9,800 miles of wiring and less than half of the 54,000 poles they had requested by January. An Army Corps map of functioning transmission lines from late January showed these challenges. The island’s rugged center and southeast were de-energized. This map shows the status of Puerto Rico’s transmission lines on Jan. 24, 2018. 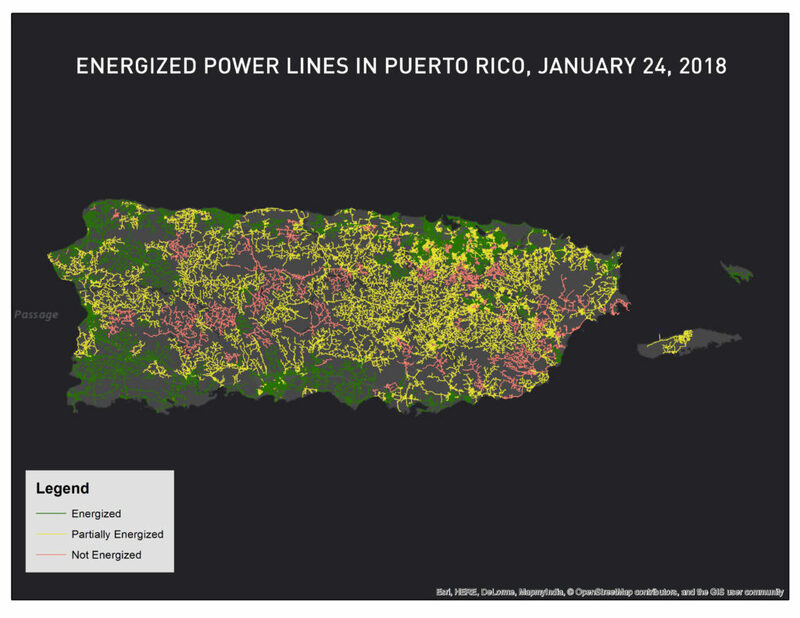 It shows locations where power lines were fully (green), partially (yellow) or not (red) energized for the island’s 3.5 million residents. In the last two months, more supplies and workers have arrived, quickening the recovery. In January, four months after the storm, 450,000 power subscribers lacked power. Today, the number is down to 105,000. New poles and wiring replaces aging infrastructure, but The Stafford Act prevents the recovery from hardening the grid against the next storm, Lloyd said. Justo Gonzalez, PREPA’s interim director, echoed this point. In the wake of the storm, he said PREPA wanted to install its power cables underground. But this upgrade would require a seperate overhaul of the grid. But there’s an alternative, some say, to replacing the aging infrastructure: a renaissance of renewables. In a white chest in an upstairs apartment in Old San Juan is a box inlaid with a green, pulsating circle that looks like Iron Man’s chest plate. It’s a solar battery — one of the key ingredients in a solar microgrid. “Batteries have made an enormous leap forward in recent years with the addition of lithium ion batteries, which is why we were able to have this self-contained system,” said Adam Gentner, head of business development for sonnen’s Latin America Expansion. 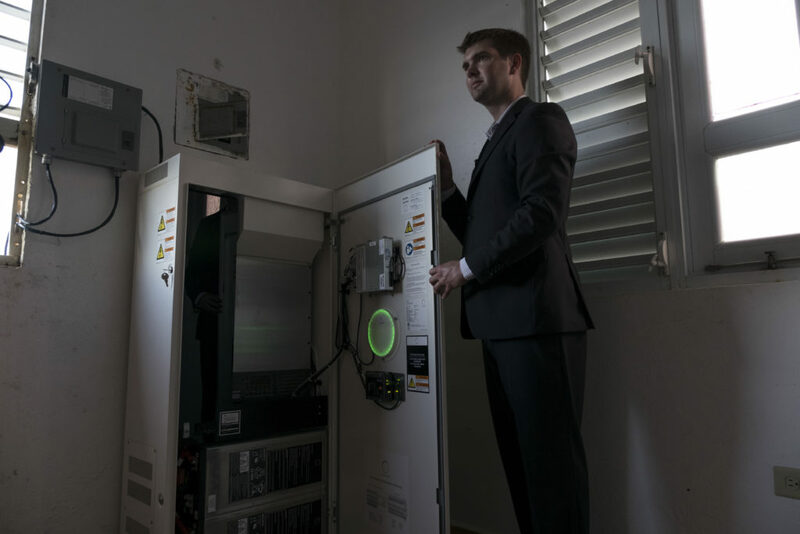 Sonnen, a world leader in solar batteries, donated microgrids at 15 key sites. They picked mostly food shelters, schools and other locations that had served as makeshift shelters after the storm. But in Old San Juan, the battery’s cables were attached on one end to rooftop solar panels and on the other to La Perla Lavandería — a laundromat. After Maria, wastewater in Puerto Rico wasn’t being treated, and the skin disease leptospirosis emerged. These solar-powered washing machines can now prevent the risks associated with handwashing clothes in hazardous water. “We use lithium iron phosphate, which is, as you can see, not a small system for a home, but it’s much more resilient to environmental factors,” Gentner said, relative to other types of batteries. This lithium-ion battery can discharge and charge up to 10,000 times. Meaning at a typical rate of one charge-discharge cycle per day, the battery would last 26 years without replacing, even in this hot humid climate which can affect battery life. One sustainability expert estimates Puerto Rico would need 350,000 solar systems to support its 3.5 million residents. But that’s not totally accurate, as residential solar systems often collect more energy than they need. This excess energy could be pooled into what’s called a virtual power plant. Unlike a standard power plant, which ships energy from a single place, virtual power plants consist of hundreds if not thousands of sources — all feeding power to the community. In Europe, a sonnen community of 10,000 residential solar microgrids produces as much energy as all the coal plants in Texas and West Virginia — America’s top-two leaders in coal power production. A smart grid is a type of virtual power plant that relies on a self-thinking network of microgrids. It can autonomously communicate where excess energy is being produce, and then decide how to transmit this juice along power lines. At the University of Puerto Rico, Mayaguez, a team of computer scientists, electrical engineers and social scientists have been designing a smart grid tailored for Puerto Rico. The project, called OASIS, has completed lab testing and is in the early stages of field testing. 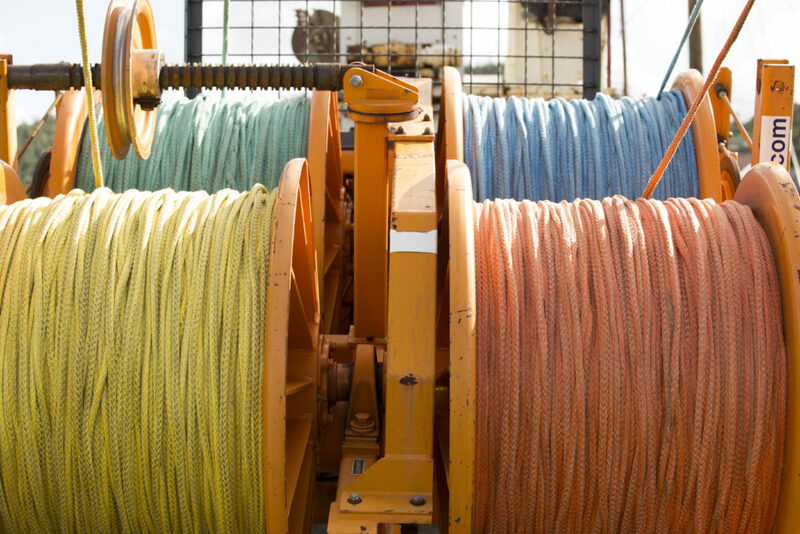 To support the smart grid, the team engineered a series of machine-learning algorithms. One algorithm predicts how solar microgrids perform in real-time by monitoring weather reports. Another tracks how much energy passes through transmission lines to prevent power surges, electrocution of line operators and blackouts. A computer chip, programmed with these algorithms, would attach to a house’s power meter and transfer switch to gauge if its microgrid is available to share energy with others. Energy information would be available to users via a smartphone app. “With the app, they can create a market, something like eBay, where you can see all the offers available for energy and the time when it is available, and then you can decide from who to buy it,” Rodriguez said. Will Puerto Rico’s solar future allow for virtual plants? As the recovery wears on, Casa Pueblo is raising funds to expand solar systems in town. It is installing solar-powered street lamps and has created a crowdfunding project to donate more microgrids in homes. Sonnen, too, has witnessed an uptick in commercial interest. “In the year, before the storm, we sold 50 [solar batteries] here. We’ve sold over 200 since the storm,” Gentner said. Resilent Power Puerto Rico, a humanitarian project that provides solar technology and training programs so locals can start their own businesses, has raised $2.5 million to distribute Tesla solar panels all over the island. What’s not yet clear is the role that PREPA might play in these new microgrids In the past, PREPA forbade individuals from selling and transmitting energy to others. Early messages from the government and PREPA about the adoption of renewables put an emphasis on corporate investment. In January, Puerto Rico’s governor announced plans to privatize PREPA over the next 18 months and create a grid with more than 30 percent renewable energy generation. Under this scheme, PREPA would likely retain ownership of its energy infrastructure — poles and wires — while private energy companies would take care of maintenance and planning. As experts point out, PREPA’s debt and emergency situation limits its leverage in negotiations with private energy companies, which may not agree with the government’s stated vision for renewables expansion. Earlier that month, Puerto Rico’s first-ever proposal for microgrid regulations called for hefty fees and restrictions for individuals who own microgrids and want to share power. Local energy players have also complained of being left out of the post-hurricane reconstruction talks. Editor’s note: The OASIS project mentioned in this story is funded by the National Science Foundation, which is also a funder of the PBS NewsHour. Andrew Bossone and Monica Villamizar contributed to this reporting.